This is a lovely dish that’s simple to prepare and elegant in its versatility. You can substitute other vegetables in place of the beans, such as cauliflower, broccoli, escarole, chard or turnips. In fact, this is my preferred method for cooking vegetables whenever I want a quick appetizer or side dish without too much fuss. Did I mention that this is also 100% vegan? Simmer or steam the beans in lightly salted water over medium heat until the beans are crisp-tender, about 5 minutes. Drain and set beans aside. Warm about 3 tablespoons olive oil in a large skillet over low heat. When oil is heated, add garlic to the pan and cook, stirring occasionally, until garlic takes on a little color, about 1 minute. Add beans to the skillet, along with a small pinch of salt. Cook, stirring frequently, until beans start to turn slightly golden brown. Stir in Italian parsley and mint. Taste for salt and pepper, then finish with a squeeze of lemon. 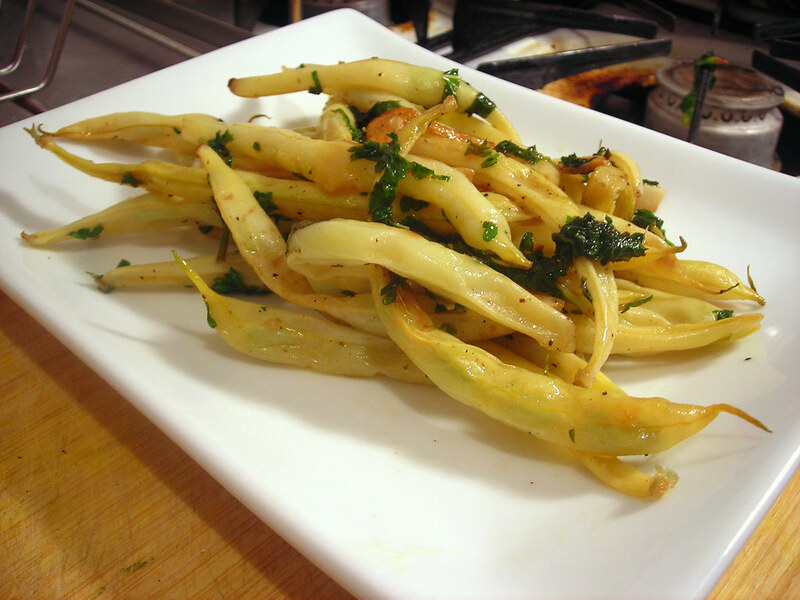 Serve immediately, as either an appetizer or contorno (vegetable side dish). This is my submission for Weekend Herb Blogging #315, which will be hosted and organized by Haalo of Cook Almost Anything. Weekend Herb Blogging is a weekly foodblogging event that was originally begun by Kalyn of Kalyn’s Kitchen. 20 Dec	This entry was published on December 20, 2011 at 2:24 am. It’s filed under food, Italian food, vegan, vegetarian, Weekend Herb Blogging, winter and tagged appetizer, beans, food photography, meatless. Bookmark the permalink. Follow any comments here with the RSS feed for this post. Prepared a serving for two. Used plenty of fresh parsley (a heaping handful), two spriges of peppermint and two regular size cloves of garlic. Next time will add more peppermint and only use one clove of garlic. I love garlic, but want to give the parsley and mint a chance to come through… Thanks!